Last night, the Mayor Sadiq Khan, thanked London’s most generous volunteering stars who are helping to make the city’s communities stronger and more cohesive, as he recognised outstanding individuals, young people and organisations at the annual Team London Awards. Actress Dame Barbara Windsor, designer Wayne Hemingway MBE, Team GB Sprint Athlete Lesley Owusu and footballer Ledley King, joined the Mayor at the celebration and presented awards to the winners. Trailblazers Mentor Volunteers, a group of mentors who support young adult offenders being released from prison. Over 70 mentors have given more than 6,000 hours of their time in the past year, helping their mentees prepare for release, set goals, build relationships and tackle issues that may lead them to commit further crimes. Ahmad Goudzari, who runs a ‘Work Club’ in his local area of Hanwell to help unemployed people with their job search and interview skills. Ahmad has already volunteered over 900 hours in the last three years alone. Cara Black African Cooking Team, an HIV charity based in west London and Elephant & Castle, where volunteers provide a hearty home-cooked meal as part of their relaxed weekly support sessions for those living with HIV in very difficult circumstances. The work volunteers do every day to improve the lives of their fellow Londoners is inspiring. Not only is volunteering good for building leadership and communications skills, it’s a great way to break down barriers and bring people from different backgrounds and parts of London together. It’s very important that we recognise those who go above and beyond their call of duty to make London a better place, and I’ve been really pleased to meet some of the city’s top volunteering stars at the Team London Awards. Sadiq Khan, Mayor of London. The Mayor is focussed on improving social integration in London. He recently appointed Deputy Mayor for Social Integration, Social Mobility and Community Engagement Matthew Ryder to help ensure Londoners from different faiths, ethnicities, backgrounds and social classes are better integrated in a city that is the most diverse in the country, where the population is at record levels and where more than 100 languages are spoken. Team London volunteers put an incredible amount of time, energy and care into projects that make our great city an even better place. I love being part of Team London and am delighted to be able to meet so many worthy recipients of this year’s awards. Dame Barbara Windsor, DBE. Across the capital, Londoners of all ages are now lending a hand in their local communities as a result of signing up to Team London. More than 150,000 adults and nearly 100,000 young people have signed up to volunteer through a range of programmes. Find out more. 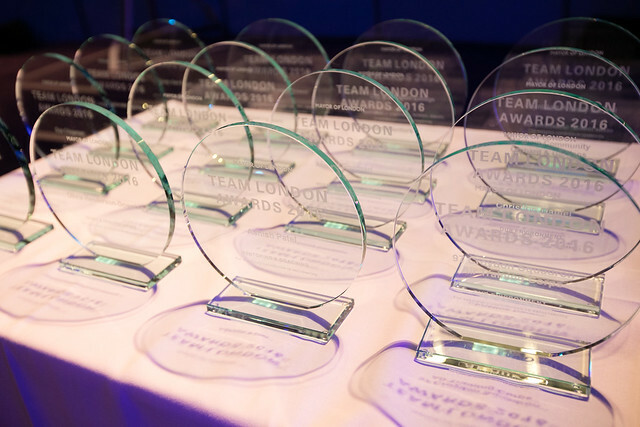 Click here for more information on previous Team London Awards. The Team London Awards, now in their fifth year, have already recognised the dedication and commitment of over 375 volunteers from across the capital.